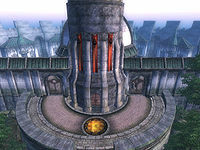 The Arcane University is the Mages Guild's center of learning in the Imperial City, accessed via a bridge southeast of the Arboretum. 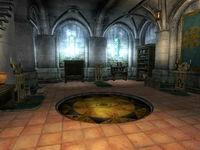 Access to the University is restricted to respected members of the Mages Guild. 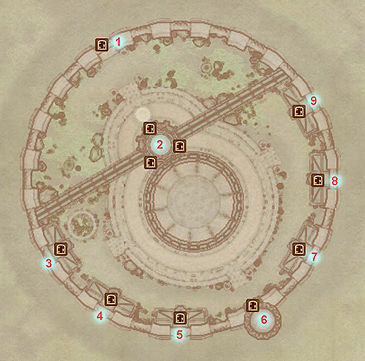 To gain entrance, a recommendation from all the guild halls in Cyrodiil must be obtained. See Join the Mages Guild for details. This is the only building you can enter before obtaining all Mages Guild recommendations. The door to the plug-in specific Imperial Orrery is across from the entrance. The two doors on either side of it lead to University grounds, which cannot be accessed without the proper authorization. 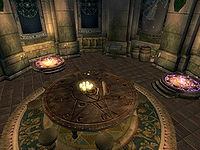 A portal on the east side of the room leads to the Arch-Mage's Tower Council Chambers. The display case beside this door holds three grand soul gems, of which two are filled, and is locked with a very hard lock. Bothiel and Council member Raminus Polus can be found roaming the lobby during daylight hours. Raminus gives quests and advancements in rank to Mages Guild members, and also sells spells to members and non-members. The entrance to this room is through a portal in the lobby. A table in the middle of the room holds scrolls of Minor Heal Other and Absorb Agility, along with a recipe for a Restore Fatigue potion. Two barrels and a sack, all containing clutter, sit on the east side of the room, with two more clutter sacks in a northern alcove. A display case with a very hard lock beside the barrels holds two replica glass daggers and an empty lesser soul gem. There are two bookshelves in the chamber; a novice alembic sits on top of the southernmost. A portal to the right of the entrance transports members to the Arch-Mage's Quarters. The two barrels respawn, but the three sacks do not. Council members Irlav Jarol and Caranya can be found in the chambers most of the day. These are Arch-Mage Hannibal Traven's sleeping and living quarters. The unique Enchanted Chest can be found here. Three bookshelves can be found within the quarters. Three novice retorts and two mortars and pestles can be found on the shelves of one bookshelf and another smaller one holds a few books, including a fragment of the Song of Hrormir, Children of the Sky and The Firmament. Between these two bookshelves stands an enchanting altar. The tallest bookcase contains many books, including Aevar Stone-Singer, Hanging Gardens, More Than Mortal, Provinces of Tamriel, The Seed, Arcana Restored, Spirit of the Daedra. This bookshelf also holds a novice calcinator. A sample of Nirnroot grows next to this bookcase. 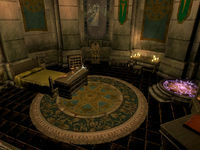 Traven's amenities include two desks, with one holding four books including a copy of Dwemer History and Culture and a copy of The Last King of the Ayleids, as well as a novice alembic and calcinator. A small wine rack lies next to his bed, containing nine bottles of Surilie Brothers Wine and a bottle of Tamika Vintage 399. Between the wine rack and the Enchanted Chest stands a spellmaking altar. At the foot of the bed a chest of drawers holds clothing, and on the left side of the bed is the Arch-Mage's nightstand, which is the only container in the room safe for long-term storage, and needs a key. A plate with two apples and a pear sits on top. The two baskets at the head of the bed hold a sample of bonemeal and another of imp gall. The quest-related Hrormir's Icestaff can be found on the drawers at the foot of the bed once the Thieves Guild quest Misdirection has been started. This room is used for enchanting. Four altars of enchanting can be found on the main floor, with one hiding in a corner. The Mysticism skill book Before the Ages of Man can be found on an altar across the room. A desk next to the front door has three common soul gems, five petty soul gems, and a sample of bonemeal on top of it. Three more common soul gems can be found on a desk across from this one along with two more samples of bonemeal. The bookshelf in the northern corner holds six novice retorts, two novice mortar and pestles, two novice calcinators, and a few books including a copy of More than Mortal. Delmar's cupboard on the southwest wall contains random scrolls, and an alembic and retort sit on top of it. Two chests, two desks, and four sacks around the room all contain clutter, and two more sacks - one beside the stairs and one in the southern corner - contain grains. The sacks and Delmar's cupboard are the only containers in the room that do not respawn. Delmar, head of the enchanting services, can be found roaming around the Chironasium during the day, while Martina Floria can be found offering Master Training in Illusion and recharging services at night. The upper level of the Chironasium can be reached by a locked door at the top of the stairs. The upper level of the Chironasium serves as a sleeping quarters for Delmar and Martina. On the southwest wall in front of the door sits a desk that contains clutter. On top of it are four pears, a calcinator, and an alembic. In the west corner are their beds, with a clutter chest beside Delmar's bed and another at the foot of Martina's, with a dish on top that holds twelve blackberries. In the north corner, a large bookshelf holds four retorts, an alembic, a copy of Cleansing of the Fane, and two scrolls - one Minor Heal Other and one Leech Health. The desk in this corner also contains clutter and holds an alembic, a calcinator, a mortar and pestle, and a common soul gem. In the alcove in the east corner, a table holds three apples, a loaf of bread, two pieces of venison, and two bottles of Tamika's West Weald Wine. A third desk on the southeast wall also contains clutter and holds on top a mortar and pestle, two empty common soul gems, and a grand soul gem filled with a common soul. On the floor nearby sit two sacks and two barrels, all containing clutter. The sacks are the only containers in the room that do not respawn. The watchtower serves as a break room for guards. The room is mostly empty, with two small benches and a table on the west side of the room set with an apple, two pieces of boar meat, three loaves of bread, a cheese wedge, two potatoes, and a tomato. A chest of drawers containing clutter can be found near the table. A small table on the east side of the room displays a sweetroll, a sweetcake, two apples, and a pear. Behind it sits a chest that also contains clutter, with a repair hammer and two clutter sacks sitting next to it. Two clutter crates and a third clutter sack sit nearby, and on the opposite side of the chest sit two food barrels. The sacks are the only containers in the room that do not respawn. A ladder on the south side of the room leads to the barracks. The barracks serve as sleeping quarters for guards day and night. Four beds occupy most of the barracks. Four chests accompany each bed, and five sacks can be found sprawled throughout the room; they all hold clutter. The chests respawn, but the sacks do not. The alchemical center of the university is run by Julienne Fanis, who can be found mixing potions in the morning and wandering the Lustratorium in the afternoon. Three copies of Mystery of Talara, v 5 can be found in a bookcase near the entrance, and a clutter sack sits beside it. In the north corner a clutter cupboard sits near a counter with two compartments; it holds several alchemy apparatus in each, and on top sit two alembics and two retorts. A desk containing clutter in the west corner also holds two mortars and pestles, bonemeal, and frost salts. Two more clutter sacks sit nearby. In the south corner a tall desk holds an alembic, two calcinators, two mortars and pestles, two empty lesser soul gems, and a sample of nightshade. A final two clutter sacks sit next to the desk and the bookshelf behind it holds a copy of the Alchemy skill book Song of the Alchemists. Two chests of drawers lie at the foot of the stairs and both contain clutter. The door at the top of the stairs leads to the upper level. This room serves as Julienne Fanis' alchemy workplace. She can be found here selling alchemy ingredients most of the day. In the western corner a table is set with four apples, a loaf of bread, a cheese wedge, a sweetcake, and a bottle of Tamika's West Weald Wine. The cupboard behind it contains food and on top sits another three apples, a bottle of cheap wine, and a bottle of Surilie Brothers Wine. A clutter sack sits next to the cupboard. A wine rack on the northwest wall holds an additional five bottles of cheap wine, another five bottles of Surilie Brothers Wine, and a single bottle of Tamika Vintage 399. The barrel next to it holds random common ingredients. In the northern corner two alchemy apparatus counters hold an array of four retorts, three calcinators, three mortars and pestles, and two alembics. The cupboard behind them holds clutter, and the barrel beside it holds random rare ingredients. A desk in the alcove on the northeast wall contains clutter and holds a calcinator, mortar and pestle, and a retort. The desk in the alcove in the east corner also contains clutter and holds more apparatus; namely, an alembic and a mortar and pestle. On the southeast wall a final desk contains more clutter and holds a calcinator, two mortars and pestles, and a sample of bonemeal. A clutter chest sits next to the desk. The single sack is the sole non-respawning container in this room. In the entrance room, the display case by the stairs holds a copy of Mysticism and an empty grand soul gem under a very hard lock. A bench sits next to the display case, with a clutter sack by the bench's leg. At the foot of the stairs is another shelf with a clutter sack under it, and at the top of the stairs is a clutter chest and another clutter sack by the door to the upper level. Across the room is a cupboard that also contains clutter with a novice alembic on it. To the left of the cupboard is a corner where two barrels and a sack, all with clutter inside, sit across from the door to the basement. To the right side of the cupboard, a wooden door opens to a small room. Two beds in the room are usually slept in by Bothiel and either Irlav Jarol or Caranya. A potted Nirnroot lies on a shelf in front of the wooden door, and the sack lying beside it holds more clutter. A cupboard containing clothes is found in the west end of the small room. A clutter chest and a barrel that holds random rare ingredients can be found near the cupboard behind one of the beds. Reached by the stairs from the main floor, the upper level hosts many beds which Mage Apprentices and some other prominent university people can be found sleeping in at night. Six beds are available for those seeking rest, although most of the beds will be filled after 6pm. 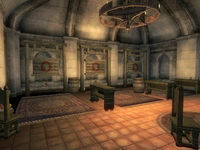 A large bookcase dominates the northeast wall in the room, and contains many items including a novice alembic and a copy of Dwemer History and Culture. A chandelier hangs quite close to the bookcase, and a little too close to the ground. A small table near the door holds a bowl with nine strawberries. Two sacks sit by the bookcase, near the door. Two more can be found in the north corner beside a bed. Yet another sack sits next to a chest in the west corner of the room. Clutter can be found in each of these containers. There are three drawers in all: one in between two beds in the southern corner has a bottle of Surilie Brothers Wine on it, another with a cheese wedge on it lies at the foot of a bed in the western corner, and the last sits near the northern corner. Each of the drawers contains random articles of clothing. A desk sits in the middle of the room. Another desk lies at the foot of a bed in the southern corner, with a novice mortar and pestle sitting on it. Both desks hold more clutter. The Mage Scholars frequently occupy the basement's beds, and is where Renald Viernis usually rests for the night. Going down the steps, a sack, barrel, and chest can all be found against the wall, each containing clutter. Further down, a sack sits on the bottom step with a desk containing clutter holding a novice mortar & pestle nearby. The basement opens up to four beds against the basement walls. A bottle of Surilie Brothers Wine sits on drawers that hold clothing near the bed in the middle of the southeast wall. Two sacks sit on the other side of that same bed, one carrying a random grain. A chest containing clutter sits obscured behind the bed in the western corner. In the southern corner, two clutter barrels and a desk can be found, with the desk containing the same items as the other one by the steps. Once again, the sacks are the only containers that do not respawn in the whole of the Mage Quarters. Note: This section lists notable books in the Mystic Archives. A complete list of books stored in the library can be found here. 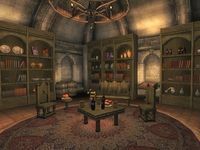 The Mystic Archives is the most extensive library in Cyrodiil. The archives are run by Tar-Meena, with frequent visitor Boderi Farano helping out. The actual archives can be found upstairs, but there are many books on the main floor as well. The stairs in the northwest corner lead up to the upper level. A desk sits right beside the entrance and contains clutter, and a stool with a copy of Necromancer's Moon on it sits close by. Behind the desk is a bookshelf holding a few books, including Modern Heretics, On Oblivion, Magic from the Sky, and Five Songs of King Wulfharth. Near the foot of the stairs lies a clutter desk. Next to the desk a cupboard containing clutter can be found with a novice alembic on top of it. In the corner on the same side of the cupboard sit three clutter barrels. 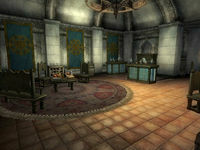 Two unlocked display cases can be found in the room, each containing a book: the one on the east wall holds the Alchemy skill book Mannimarco, King of Worms, while the one on the south wall holds a copy of Fighters Guild History, 1st Ed. 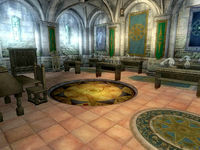 The bookcase on the east wall holds a few books, including Cleansing of the Fane, Dwemer History and Culture, and the Destruction skill book Response to Bero's Speech. All of the containers in this room respawn. The upper level of the Mystic Archives contains an impressive collection of books from across Tamriel. It has the appearance of a typical library. On the north wall beside the door is a desk which holds two empty common soul gems, two samples of bonemeal, and clutter. In the northwest corner of the room a small reading area holds a chest of drawers that contains more clutter and a table that holds a copy of Children of the Sky. On the chest of drawers, two empty common soul gems and samples of bonemeal, ogre's teeth, and nightshade can be found. A desk in an alcove on the west wall holds more clutter. A clutter barrel sits in the southwest corner next to a display case that holds three books; Hanging Gardens, The Wilds Elves, and the Conjuration skill book Liminal Bridges. On the south wall, a display case between two large bookshelves holds a copy of Spirit of the Daedra. The bookshelf on the right holds six bottles of Surilie Brothers Wine, a clutter sack, four novice retorts, a novice alembic, and several books including The Third Door and the Illusion skill book The Argonian Account, Book 3. The bookshelf on the left holds a novice retort and several more books including Magic from the Sky and three copies of The Firmament. Two clutter barrels sit in the southeast corner, next to the third bookshelf. It holds an alembic, a calcinator, a retort, and several notable books including Hanging Gardens and The Last King of the Ayleids. With the Knights of the Nine official plug-in installed, The Adabal-a, The Knights of the Nine, and Shezarr and the Divines are also found on the shelves, as well as all eight volumes of The Song of Pelinal along with a second copy of volume seven. Two clutter sacks sit between the bookshelf and the door. In the center of the room lies a small table surrounded by chairs. A small stand holds a plate with two apples and a pear, while the table holds two more apples, a loaf of bread, two bottles of cheap wine, and a seventh bottle of Surilie Brothers Wine. The three sacks are the only containers that do not respawn. This area is where the mage apprentices practice their spell-casting. Renald Viernis is the Proctor of the practice rooms, and can be found casting spells most of the day, along with a Mage Apprentice. The stairs in the northeast corner lead up to the upper level. The main floor contains two spell target boards on the right side of the room, and an additional target in the corner on the left side. There are a several containers in the room which all contain clutter: two sacks and a chest in the northeast corner, a desk and another chest beside the stairs, a chest of drawers on the south wall, and four barrels—two in the northeast corner and two on the south wall. The two sacks do not respawn, but the other containers do. There are four target boards on the upper floor, with one of them in a corner. Apprentices practice their spells here most of the day. There is nothing of much note on the upper level, with two clutter barrels, four clutter sacks, and a desk with the same contents scattered around the room. A small stand with a plate that holds two apples and a pear is near the door for mages on break. A table surrounded by two chairs on the east wall has a plate with two apples and a loaf of bread on top of it. The two barrels and desk respawn, but the four sacks do not. This room is used for Spell Making. The powerful magicians Gaspar Stegine and Borissean can be found here during the day selling spells. The stairs on the left side of the room lead to a door to the upper level. A clutter desk sits on the northwest wall, next to the stairs. In the northern corner an altar of spellmaking can be found, as well as a shelf with a novice alembic and retort. Five of these shelves with the same contents can be found on the southeast wall, with an additional shelf holding an extra retort. Across the room from the door, an altar and clutter cupboard can be found. Both the desk and the cupboard respawn. 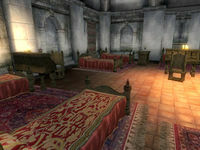 The sleeping quarters of Borissean and Gaspar seem crowded compared to the almost empty room downstairs. By the door is a barrel and a desk, on which two samples of frost salts sit. Next to the desk are two barrels, and behind those in the corner are a podium and a stand, which a plate of bonemeal sits upon. In an alcove on the southwest wall, a desk with three novice mortar and pestles and two samples of bonemeal can be found. A crate, two sacks, and two barrels sit near the desk. Behind the crate is a bookcase that contains two alembics, two calcinators, five mortars and pestles, and two retorts. To the left of the crate, a table set with two apples, a loaf of bread, two bottles of cheap wine, and a bottle of Surilie Brothers Wine sits surrounded by chairs. The east side of the room holds two beds. A stand with an apple and a pear sits by the bed closest to the door. In between the two beds are a barrel and shelf, which holds a calcinator, a mortar and pestle, and a retort. All of the containers in this room contain clutter, and all except the two sacks respawn. Although the mages spend many hours practicing on the spell targets, they cannot be used to increase your skills. 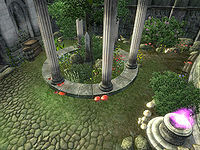 The Alchemical Garden outside the Lustratorium provides a large assortment of different ingredients that may otherwise be very hard to come by; more plants can also be found outside the other university buildings. 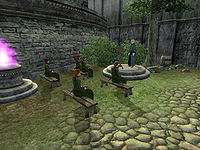 The Lecture Area outside of the Praxographical Center hosts a series of lectures about Doomstones and Runestones. See the University Lectures page for the actual lectures and the times they are given. The Imperial Orrery is the large building in the center of the university. It is the focus of the Orrery official plug-in, and the locked door cannot be opened without it. You can unlock it with the console or view it in the Construction Set without the plug-in, but it is just an empty oversized room. Scholars and Apprentices will defend you from local law enforcement if they see you being chased by a guard or battlemage. They summon armor and weapons and can easily take down a surrounded guard. Occasionally shots may kill fellow mages; other mages will generally retaliate, starting a skirmish that won't end until only one mage is left. Liberation or Apprehension? : Locate a Necromancer informant and return him safely to the Arcane University. Repairing the Orrery: Harness the power of the stars. Rebuild the defiled Orrery and unlock the secrets of this Mages Guild Inner Sanctum. Esta página foi modificada pela última vez à(s) 08h29min de 3 de dezembro de 2015.